Meridian Design's m�V is a battery-powered, portable, ultraviolet (UV) C water purifier. The tiny m�V treats drinking water by inactivating biological contamination, including viruses, bacteria and protozoa (including cyst forms). The UV-C magic is provided by an electrical lamp at the m�V's tip. The dunk-and-operate design allows its use in a variety of containers, including bottles, jars and cook pots. The m�V is truly self-contained, with a permanent internal battery rated for 16 charge cycles at an average of 1 liter (34 fluid ounces) per cycle. 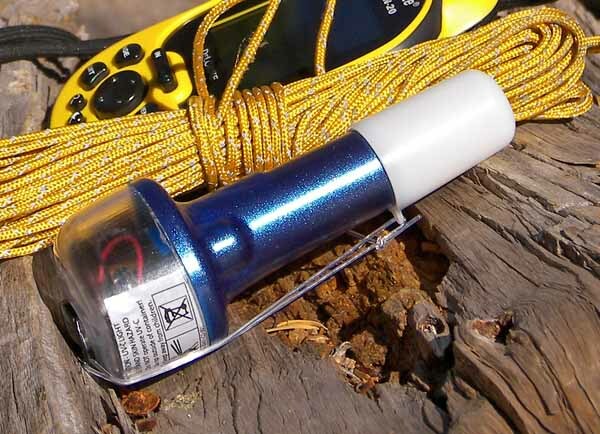 An added feature is a small white LED that provides operational status and doubles as a small flashlight/lantern. The m�V is charged using an external source by one of three options: wall current, battery, or solar panel. Note: the m�V only runs from its internal battery, so must be charged to work. It will not run directly off an external battery. The works: m�V, protective cap, filter bag. 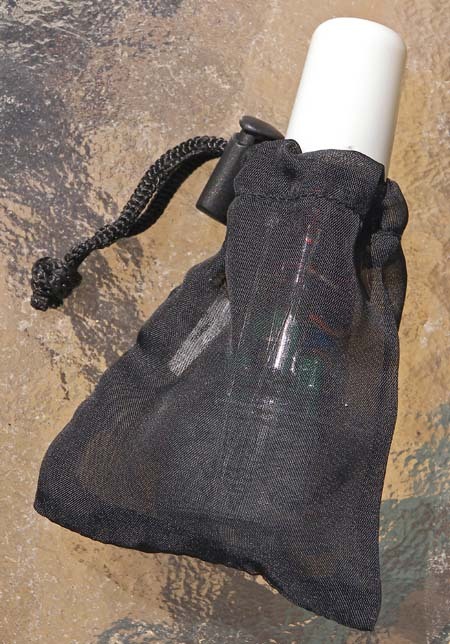 The m�V comes equipped with a filter bag, a protective cap for the emitter lamp and instructions. The protective cap glows in the dark, making the m�V easier to find at night. When stretched across a container's opening, the 0.4 mm mesh filter bag strains out large debris. The m�V is mushroom-shaped, with the emitter lamp at the end of the "stem" and the wire access cover at the other end, atop the mostly hollow "cap." This design ensures the m�V floats with the tip extended into the water. The m�V is carefully sealed but isn't completely waterproof, because the metal cover lacks any sort of gasket. A D-ring wire bail on the twist-off cover functions both as a handle and an anchor for the stretchy cord that tethers the protective cap. Remove this steel cover and the magnet-tipped wires come with it, eliminating the need to fish them out through the little access hole (which would otherwise take a dentist's skills and toolkit). Next to the cover is the m�V's sole control: a pushbutton. The m�V body is clear plastic in two pieces, glued together. Simple pictographic instructions appear on one side of the top. The quartz UV lamp extends from the other end; the lamp's base is cemented solidly in place inside the plastic body, using epoxy or resin, and gives the neck the appearance of being tough enough to drive over with a car. Above the lamp are the battery and circuit board. The pushbutton is on top, off-center and beneath a silicone rubber cap. The steel cover is a quarter-turn bayonet design. Wire compartment cover also anchors safety cap. Magnetic connectors cling to steel cover. The m�V's internal battery is a lithium-ion CR123 equivalent, rated for 500 charge-discharge cycles. Note that Li-ion batteries have minimal self-discharge, which bodes well for long times between charging and use, but also lose storage capacity over time, which will result in fewer cycles between charges. 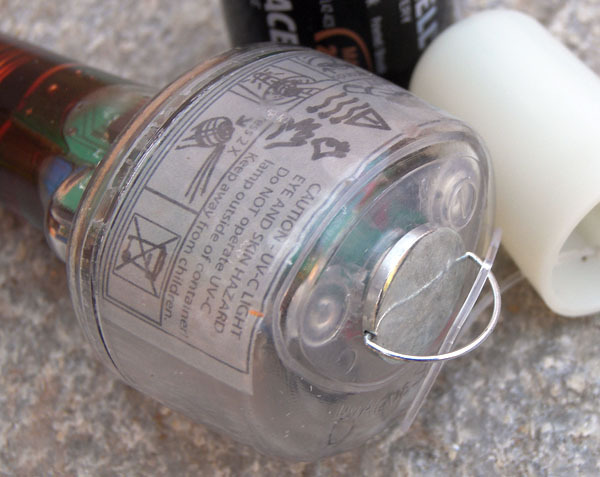 The battery is not user-replaceable, nor is the UV emitter lamp. Meridian Design has a low-cost return-for-replacement policy should the unit fail or wear out after warranty, currently priced at $20. The m�V is quite small and light at 4.75 x 1.75 inches (12 x 4.5 cm) and 2.6 oz (74 g), including the filter bag. It's somewhat pocketable (e.g., a pants-leg cargo pocket) and easily fits in most backpack external pockets. It's somewhat longer than the mesh bag, which is a bit odd. While the inch-long (2.5 cm) quartz lamp tip is certainly breakable, it's well and completely protected by the removable cap when not in use. The rest of the unit should tolerate abuse (drops, etc.) without much problem. The m�V fits through the opening of standard (Nalgene)-width water bottles (2 inches/5 cm wide). This opens a vast array of water containers with which to use it, as well as any cookpot. An additional trick is that it plugs into common drinking water and soda bottle necks, sealing the opening and allowing it to be inverted and agitated without leaking. The little m�V floats in a large, soft-sided container. Using the m�V is simplicity itself: 1) remove the protective cap, 2) Press and hold the button to start the cycle, and 3) drop it into the water. The lamp operates for about 75 seconds and then shuts off automatically. Each cycle treats 1 liter under average conditions; for additional water and/or adverse (cold or turbid) water conditions, more cycles can be repeated as required. The LED inside the m�V is initially steady on start-up, then blinks to alert that the UV lamp is starting. This is a signal to place it into the water, and gives ample time to avoid direct exposure to the UV C rays*. Water should be agitated during treatment, with the goal of ensuring all water (and critters) pass close enough to the lamp for effective treatment. In an open container this means swirling the container or stirring the water. In a narrow-neck bottle, this means intermittent inverting. The m�V floats low in the water and I want to avoid complete submergence, given the lack of a watertight cover seal. I believe I've found a solution in a long-handled stir spoon for use in a pot or wide-mouth container. The m�V's also function as a flashlight. Double-pressing the button turns on the fairly bright (quarter-watt) white LED for about 12 minutes, after which it first dims, then shuts off. Per the instructions, each lamp cycle consumes 2% of the battery's capacity. Light output is roughly the same as from a button cell LED flashlight. Charging the m�V is the same process regardless of the power source. After retrieving the wire leads (attached magnetically to the cover) stick them to the battery or charger poles--red to positive, black to negative. The m�V's LED blinks about once a second while charging is underway; a longer, irregular blink interval indicates the unit is fully charged. As far as batteries are concerned, the m�V can charge from any 1.2-volt rechargeable, any 1.5-volt disposable or any 3-volt camera battery, and even a 9-volt "transistor" battery. The unit recognizes higher voltage supplies and charges through a "switcher" circuit, while lower voltage sources charge the internal cell directly. The same process is used with chargers, whether solar panel or house-current "wall-wart." Most any battery will recharge the m�V. The instructions are comprehensive, covering technology and specifications, operation, troubleshooting and general treatment guidelines. Meridian's Web site offers further information. The m�V arrived charged and ready-to-go. I cycled it several times to get the hang of the operation, played with the flashlight function, then charged it overnight using a fresh alkaline D cell. As described, the flashing LED provides charge status: about one flash per second initially, then a much slower flash rate. 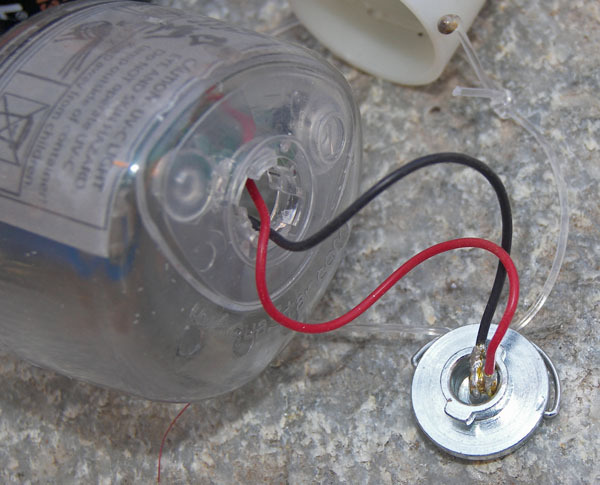 Hooking the leads to a 9-volt battery gave a steady LED, indicating the unit's fully charged and dumping the unneeded current. However, the m�V failed a last-minute test as I was headed out on a backpacking trip, and now refuses to ignite the UV lamp. I've been in contact with the Meridian Design folks, who quickly provided some things to try but none has restored the m�V to life (it seems to charge and the flashlight function works, but won't cycle). So back it goes for evaluation and possible replacement. The m�V is simple to use, overall. My only design concerns are the lack of sealing for the cover--potentially allowing water to slosh inside--wetting the works, and the cover's slender bail, which has already come off a few times under the stress of the elastic band. Note: This test m�V is a preproduction unit, so changes and refinements are possible before it's distributed. I presume, for example, that the filter bag will be enlarged to fully store the unit. In the bag: The capped m�V doesn't quite fit the filter bag. 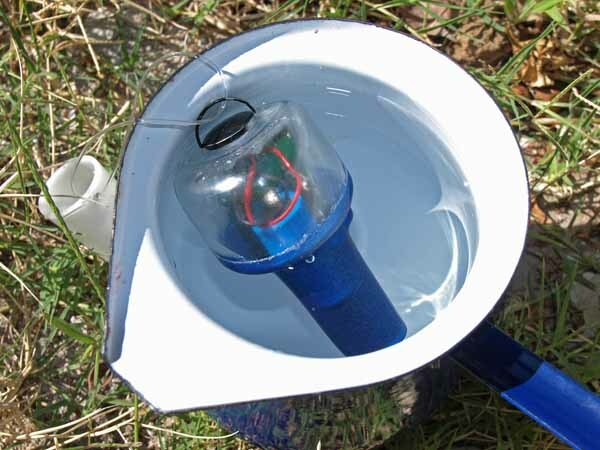 I'll be testing the m�V in a variety of conditions and settings, using a variety of water sources and containers. Some trips will be solo, others with a hiking partner, so the volume of water to treat can range up to as much as 12 gallons (1 gallon/person/day x 2 people x 6 days)--nearly 50 1-liter standard treatment cycles, which implies three or four complete discharge-recharge cycles on the fly. Water needs will be a combination of on-the-go and campsite water. Water sources will be streams, lakes and ponds and I'll use a combination of bottles, soft containers and cookpots. �	Ease of use in the field? 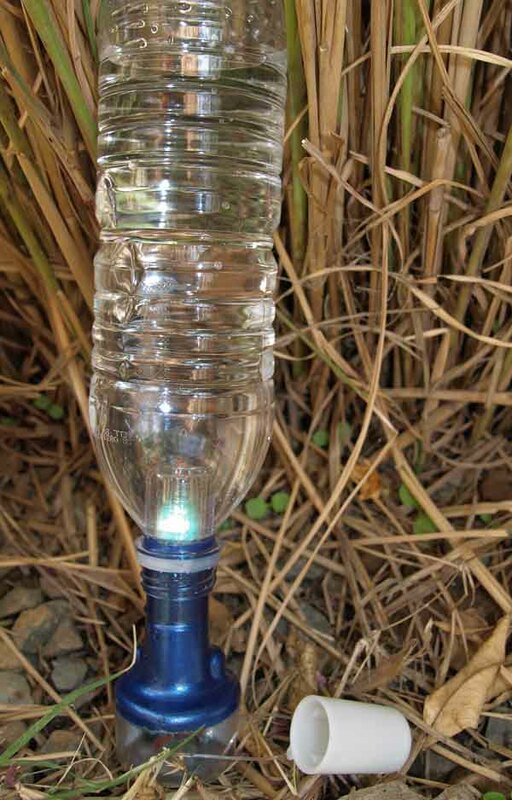 How simple is the m�V to carry and retrieve and use for trailside water collection. How much work is gathering larger amounts in camp? How easy and effective is the prefilter? Can I operate it with cold, wet or gloved hands? Which containers are easiest to use for treatment? �	Performance. How many cycles will I get per change? How will temperature affect performance? Will I have to preheat very cold water? How long will a field charge take? How many charges will I get from external batteries? Will the leads stay on while charging on the go? �	Flashlight mode. How useful will this feature prove to be? �	Maintenance. Other than charging, will the m�V require any maintenance? In summary, can the little mUV serve all the water needs of one or more hikers for trips ranging from one to several days? 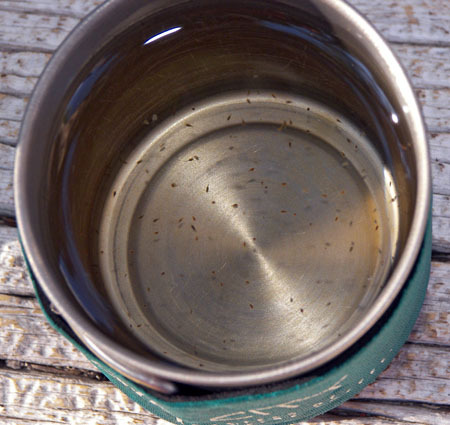 Will we make it thought the summer's hiking without falling prey to waterborne disease? Stay tuned! The m�V takes the portable UV-C treatment concept a step further towards true portability and ease of use. I'm very much looking forward to putting it through its paces this summer! * Meridian Design provides the following safety information about UV-C exposure: "UV-C light can cause irritation to the eyes and skin if exposed for an extended period. 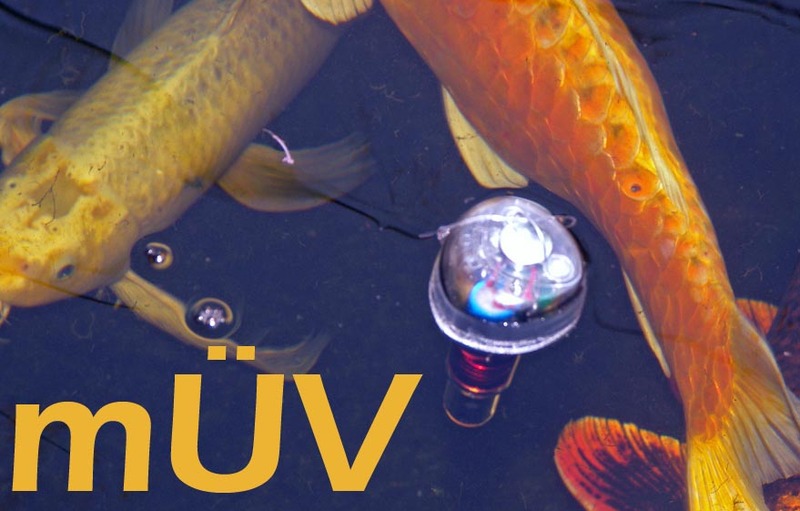 The UV-C light is reflected back into the container by the water surface and is absorbed by all common container materials (including plastic, metal and glass except quartz) and is therefore entirely safe when operated as intended. If the light is ever turned on outside of the container the user should simply turn it off by pressing the button again. Operation in air generates ozone which is an eye and lung irritant." My sincere thanks to Meridian Design and BackpackgearTest for the opportunity to test the m�V! Replaced and charged, the m�V headed into the field. I took two solo overnights and two day hikes with the replacement. My cycle totals were eight and ten on the overnights, and three on the first day hike. The second day hike was a different story (detailed below). I also used the lantern for reading, although it requires handholding to aim correctly. No recharging was required on any of these trips. All trips were taken in California's Tahoe-region Sierra Nevada, with elevations ranging from 6,000 to 9,200 feet (1,830-2,800m). Weather was fair on all trips, with temperatures ranging from the 80sF (30C) during the day to a low of about 40 at night (5C). Source water was from streams and lakes, and I'll estimate water temperatures ranged from the mid 50sF (12C) to the high 30s (5C)--the last being snowmelt water. Meridian Design replaced the failed original test m�V. It arrived with a note that the first unit had a bad solder joint. The new one worked as promised, charging and operating as described in the directions. I didn't notice anything different from the first one, other than the LED was brighter in lantern mode, throwing a brighter and more distinct beam that more resembled a flashlight's than the first unit. I also realized I had miss-characterized the metal lid as non-waterproof. I now believe it is at least water-resistant, as the same silicone skin that covers the top button extends to the opening, providing a gasket-style seal for the lid. Because the m�V will get completely dunked bobbing around in a large container, this is an important guard against water entering the works. Since there is exposed circuitry inside, I feel it's important to keep the interior dry. Which water container I use depends on whether I'm on the trail or in camp. 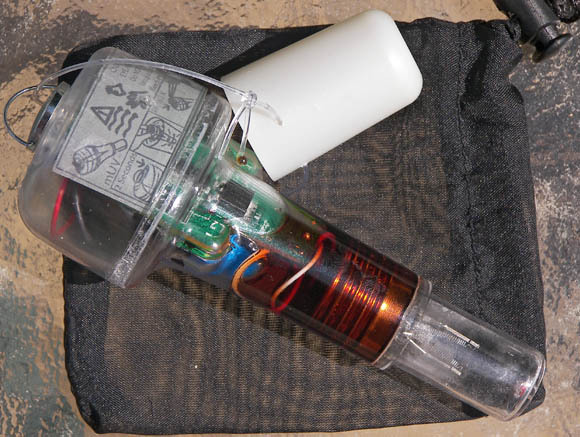 A narrow-mouth water bottle (most any brand from the market) allows the m�V to be used as a plug. Fill the bottle, plug in the m�V, switch on and invert/return while it's cycling. In camp I've come to like the 96 ounce (2.8L) Nalgene Cantene. I don't fill it all the way, so there's plenty of room for sloshing the water during treatment. I cycle it twice to treat the approximately 2 liters of water. This requires removing it to cycle the second time, which makes a string attached to the bail pretty much a requirement. The third option is treating in a cookpot. 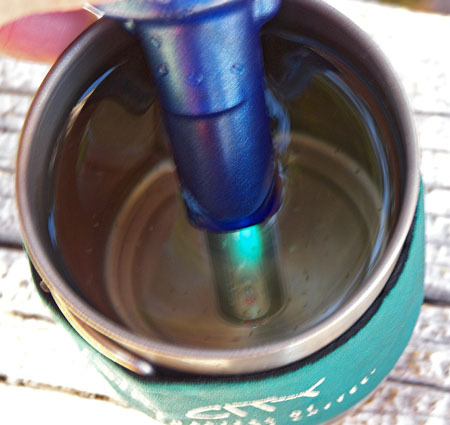 This is quite feasible--just place the m�V into a pot with water and stir with a utensil. Simple, if the pot isn't being pressed into kitchen duty or greasy from poor cleanup after the previous meal. m�V fits a relatively small pot. 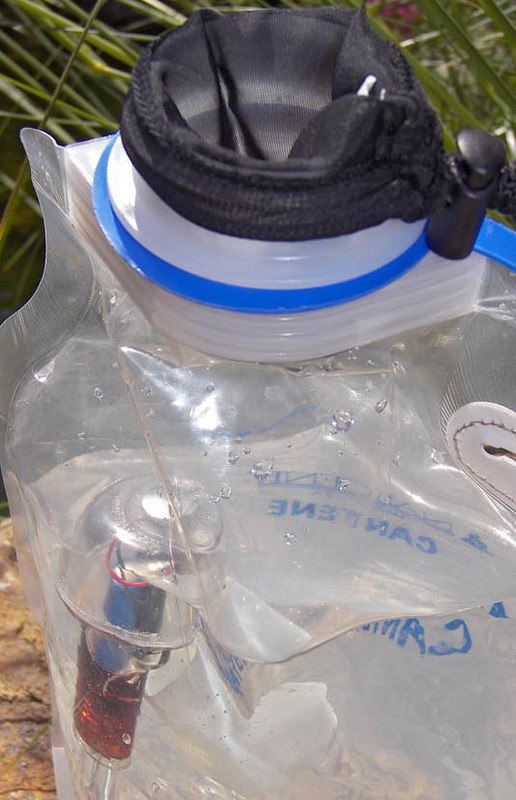 The filter bag is a tight fit around the nearly universal Nalgene wide-mouth opening. A bit of struggle and it will go on. It does readily keep out larger debris, and I'm careful not to use turbid water sources that would mean treating cloudy water. As the instructions warn, dirty water warrants extra treatment cycles. On my second day hike with the m�V, it refused to completely cycle. I first suspected it was due to the snowmelt source water, which I allowed to warm before treatment. But while the m�V would begin its cycle, it would noticeably dim within a few seconds and wink out completely after perhaps half a minute. The flashlight still worked. Back home, I tried charging the m�V numerous ways over two or three weeks, but failed to stir it back to health, despite an indicator LED that signaled charging was taking place. On the final charging round, using a 9V transistor battery, the m�V became noticeably warm to the touch and thereafter ceased even pretending to charge. I've since sent it back to Meridian Design, who will be replacing it with a production unit as soon as they're available. The Meridian Design m�V is clever, easy-to-use, lightweight water treatment. It has the potential to replace chemicals and filters alike, but the production units must prove reliable before it can reasonably take their place in the field. Is three a charm? I'm eager to get going again with my testing once the replacement arrives, and intend to use the m�V for the rest of this hiking season. While I've answered the ease-of-use questioning, I've not yet done in-field charging on longer trips. And at present, I don't know how many cycles a fully charged unit will deliver. The second replacement m�V (unit #3) arrived in time for a bit of familiarization and then to accompany a hiking buddy and me on the last trip of the summer--a four-day flog in the northern Sierra Nevada. This is a production unit, and the only visible differences with the prototypes I used earlier are a spiffy paint job and much-improved readability of the on-board instruction label. Functionally, everything is the same as before. Production m�V in sparkly blue. Conditions on this final Sierra trip were clear, windy and cold, with air temps perhaps as warm as the mid-50s (12 C) and around freezing at night. Did I mention windy? All treated water was lake water in the 50s (12 C). (Running water is very scarce at present in the Sierra.) Our route included a good deal of difficult crosscountry travel, so the m�V's light weight and compact form were very welcome. I carried it in my pack's top pocket, easily accessible on the go for treating water at lakeside rest stops. Initial performance�operation and charging�of the production m�V were fine. The UV lamp quickly lit and soon achieved maximum brightness. The UV lamplight alternated between pure blue and blue-and-white, as one of the filaments sometimes glows bright white. By my count, the m�V treated about fourteen liters of water before failing to cycle, due to a spent battery. I also performed a few�experiments on this charge (more below). Coincidentally, the internal battery expired as I was treating trail water for the hike out. Most water was treated in a three-liter (96 oz) Nalgene Cantene, with wide-mouth opening. I've settled on leaving some airspace, dropping in the m�V with cap dangling over the edge to keep it from floating out of reach, and cycling the m�V while squeezing the container sides to maintain water movement. It's not hands-free but it's easy. Alternatively, I used .5- and .75-liter narrow-mouth bottles to treat small amounts at a time (shutting down before completing an unnecessary entire cycle). This method calls for using the m�V as a plug and slow inverting and returning while treating. In all cases I used the supplied filter bag on the container's opening. One lake we camped at has a large marsh along one shoreline and water fetched nearby had an active copepod population, including cyclops and other species I couldn't identify. Like any kid with a magnifying glass and an anthill, I decided to find out what the m�V would do to these little swimmers. A treatment cycle in my cup deep-sixed the cyclops, but left the others swimming (presumably shouting "ouch, ouch!!"). These little tests show the value of the m�V's prefilter, as the mesh is small enough to keep out these multi-celled critters, many of which won't be touched by a normal treatment cycle. My motto is to always use the very best source water I can, regardless of how I'm treating it. Some sink, some swim on. 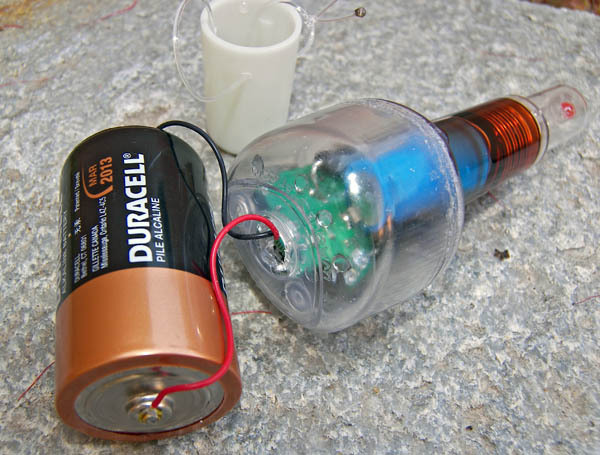 On the hike out I hooked up my spare battery�a 1.2V NiMH AA cell�to see whether the m�V would charge on the trail. I've wondered whether the little contact magnets would stay in place. In this instance they did, in my pack's top pocket, and the unit was charged sufficiently to cycle when I unpacked it ten or so hours later. However, in preparing this long-term report I recharged it for some final photos, only to discover it won't complete a cycle. An overnight attempt to charge it failed, and after conferring with the Meridian Design folks I'm sending it back so they can determine why. 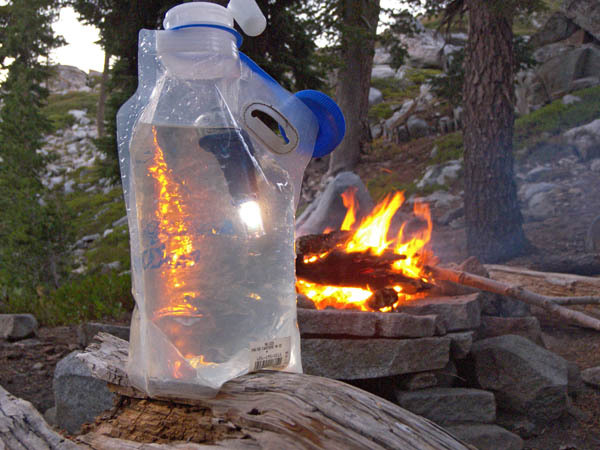 The m�V premise is an intriguing one: Can a small, light, relatively inexpensive UVC treatment device cost-effectively serve the water needs of small backpacking parties for extended periods? Despite my truncated test period, I believe the answer can be yes. The production m�V provided all the drinking and cooking water needs of two hikers for four days, before requiring a recharge. Then, in the time it would take to walk to the next camp, it recharged in the field at virtually no expense (other than the initial cost of one rechargeable AA cell). To me, this field recharging capability is a significant advantage over continually filling a UV unit with disposable cells, especially costly lithium camera batteries. For those folks traveling "off-grid" for extended periods, the accessory solar charger will be a very attractive alternative to charging from supply batteries. m�V's easiest mode is plugged into a standard water bottle. However, I regret that I can only give the m�V an "incomplete" at this time, until the latest charging problem can be assessed and conquered. Meridian Design has been extremely responsive to all my questions and feedback, and I'm confident they'll sort out any remaining problems. I admire the cleverness of the recharge contact magnets, but note that in transit it's not hard to tug one of them off the battery, interrupting the charge process. I'd recommend some way to anchor the battery to the m�V such that they stay together whilst getting knocked around in a backpack. I'd also prefer a more definitive way to signal a full charge, such as an LED that changes color. In the continuum of water treatment simplicity, I place the m�V behind dry treatment tablets and gravity-feed filters, and ahead of two-part chemicals and all pump filters. The m�V beats competing technologies in treating volumes of water quickly, while besting all but the rare viral filters in efficacy. I don't think we've seen the last development in UVC field treatment, but with the m�V I believe we're seeing the present leader. Once the technical glitches are fully sorted out, I'll resume using the m�V, both for day hikes and backpack trips. It's easy to use, small, light and effective. It doesn't affect water's taste and it's inexpensive to operate.